"Confirmation is the sacrament through which the Holy Ghost comes to us in a special way and enables us to profess our Faith as strong and perfect Christians and soldiers of Jesus Christ." Confirmation is very important since it is the sacrament that gives us the extra sacramental graces necessary to persevere and get to Heaven. If you have the opportunity to be confirmed, treasure it and prepare well! If you're looking to have your children confirmed, you'll like these ideas. The classic Catholic answers are definitive and easy to remember. Generally you learn the most about the sacraments of Baptism, Penance and the Holy Eucharist when you are studying for First Communion. What's next? You study the doctrines about the Holy Trinity for Confirmation. What Is Confirmation? Learn the Easy Way. 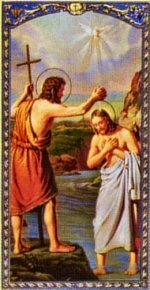 The sacraments of Penance and the Holy Eucharist. Did you also know that the graces of your Confirmation can all be restored by a good Confession? This applies to each of the Sacraments including Holy Orders and Matrimony! Think of having all of these graces restored! The booklet called Confession - Its Fruitful Practice explains that this restoration is proportional to our sorrow, according to St. Thomas Aquinas on page 18 (Tan Books). Be sure to think of this so as to become a better soldier of Jesus Christ once you are confirmed, ordained, or married. What is Confirmation? The BC gives the definition. Value? Buy and download once. Print forever. Confirmation assures us of the graces that you should dread to miss. No other sacrament and no other activity in the world can offer such protection and assurance on your way to Heaven. When you're preparing for Confirmation it's time to learn about the Catholic Holy Days of Obligation as you'll need to know them every year. Ascension Thursday, 40 days after Easter. The Assumption of the Blessed Virgin Mary, August 15. The Immaculate Conception, December 8. All Saints' Day, November 1. "One. Christmas Day, December 25. Memorize one line at a time with its number and then practice them together in order. This is a good trick with any list like the Catholic Ten Commandments. A younger student can use his fingers to keep his place till he is handy with the list. This way the number is the clue in a long list. Another idea: Think of there being three holy days for Our Lord, two for Our Lady, and one for the Saints in Heaven. Why is Christmas first? The reason that Christmas Day is the first Holy Day on the list. The Catholic liturgical calendar begins with Advent, four weeks before Christmas. 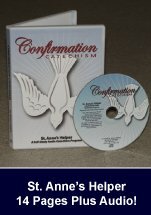 Study these easily with Saint Anne's Audio Catechism (CDs or Downloads) and Catechism Worksheets. What is Confirmation without choosing a Confirmation name? Choosing from amongst the many Catholic saints names can seem to be a big job, so be sure to read a general book on the lives of the saints in good time before you choose your name. This can be very early depending on how soon Sister asks for your registration. Catholic Liturgical Calendars and Catholic Missals can also make the job easier. Fr. Lasance Catholic Missals tell a short story about the Saint of the day in the back of the book. Tan Books sells a complete list with variations in a booklet called Is it a Saint's Name? And books on individual saint's lives are a great way to get to know your favorite saint so that you can choose a patron who will suit your personality. Find more on choosing a saint's name here. What Are Some Confirmation Symbols? What is Confirmation without learning its symbols? Many catechisms do not teach these, but they are at least interesting to know. You'll be reminded of the Holy Spirit throughout the day if you know His symbols. 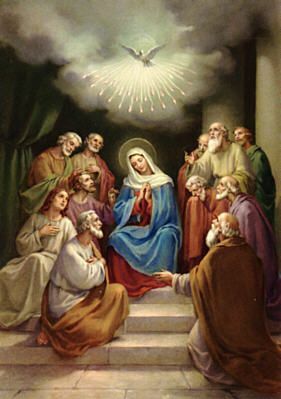 Catholic art frequently shows the Holy Ghost as a dove or as tongues of fire, as in many beautiful pictures of Pentecost, when the Holy Ghost descended on the Apostles and the Blessed Virgin Mary. Frequently you'll also see a cloud, water or some depiction of oil. Oil is more often a verbal symbol as in speaking of the strength Confirmation confers. Remember, the base word to Confirmation is "firm". Learn these symbols easily with St. Anne's Helper Audio Confirmation Catechism CDs and Catechism Copybooks! 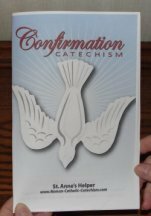 What Is A Good Confirmation Catechism? 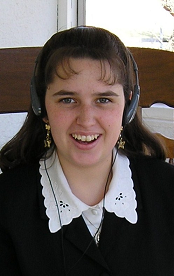 Audio Catholic Confirmation Catechism: Like having a Catholic tutor for memorizing.